If you can deceive, you can achieve in the CIA. The Recruit introduces us to James Clayton, played by Colin Farrell. James is a brilliant MIT student who is quite talented with computer programming. While at a career fair, James demonstrates his tech aptitude and catches the eye of a onlooker. Later that night, the the onlooker shows up to James’ place of work, and reveals himself as Walter Burke (Al Pacino), a Central Intelligence Agency recruiter. James has no interest in the CIA, but when Walter starts bringing up James’ father, who apparently disappeared under weird circumstances, interest is ignited. Before we know it, he is on his way to interview for the clandestine service at Langley. Many tests are taken at the Langley headquarters, and everything is measured, taken into account, and visible through the-all encompassing eye of Burke. His goal is to find a NOC, or Non-Official Cover, a person with no ties to the government and no real safety net like say an official agent would, for his own gain. When James competes his training, he becomes the NOC and his first objective given by Burke is to find a mole within the Agency. The tests are over, and this is the big time. Or is it? If that short summary does not entice you, I do not blame you one bit. It probably could have been written better just like this movie. 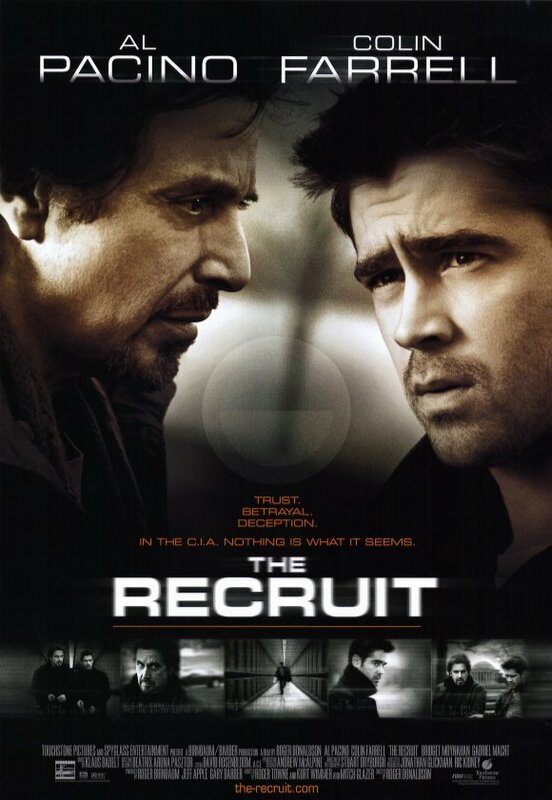 The Recruit is not a bad movie, but it was clearly made to be a spy classic and it just isn’t. It aims high and misses wide. When watching a spy and/or political film, it is commonplace to see a few twists and turns. These are present here, minus the few part. The first one or two turns is fine, but once the movie bombards you with more and more, you inversely care less and less. Who cares if the internal mole is found, if the father mystery is resolved, or if the two lovers are playing a dangerous game of cat and mouse? At some point, a movie has to make its audience believe in something, and when the movie spends the bulk of its runtime beating us over the head with “everything is a test,” why should we care about “danger” or “failure?” Ultimately the plot is way too contrived to really enjoy. 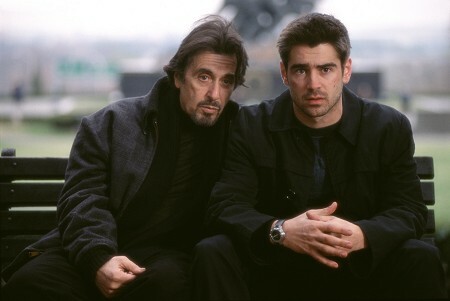 Al Pacino and Colin Farrell are twin billed as the leads. Their performances are not terrible, but their respective roles are not shining moments in their filmography. Pacino is able to act in his sleep, and he appears to do so here. It is the same performance you have seen from him in 90% of his films since the 2000’s. The line is crossed a few times into hammy territory, especially at the end. As James Clayton, Colin Farrell turns in a respectable if forgettable performance. His Scottish accent slips in from time to time but nothing to completely draw one out of the film. As a whole, he fails to bring any intrigue to his character. Part of that is on the writing for it, and part of it is due to the simply lackluster performance. Farrell has always been hit and miss with his choice of roles and this one seems to be more of a miss. The only other notable character is played by Bridget Moynahan, who serves as the predictable love interest. She is OK to look at but her acting here leaves much to be desired. Her chemistry with Colin feels nonexistent and gives yet another reason not to care. I do not know much of her work but a quick survey on a very popular message board shows that there is a sizable amount of people who believe her acting skills are not of high regard, so take that as you may. Director Roger Donaldson uses a sort of murky color palate with this film. Not a lot is vibrant, and most scenes look and feel murky, probably to serve as a representation of what the film is getting at: uncertainty. It works, but nothing is particularly striking. It truly could have been shot by anyone, which is not exactly a compliment. At the end of the day, there is nothing truly atrocious with The Recruit, but everything is average and nothing stands out. Films like these sometimes are worse than bad films. At least with bad films, some are real fun and deserve coming back to for a good time. As definitively objective as I can be, I say that this is not one of those films, and if seen once, I would be surprised if you came back to it again. Photo credits to moviepostershop.com, IGN.com, and http://www.tribute.ca. I never saw this, mostly because I expected it to be middling, an expectation you confirm. I will probably keep staying away. Thank you. Sad really, I enjoy Pacino and Farrell most times, but the film aims to be something big and it is not.